In today’s fast paced environment of the printing industry, time is money and you don’t have time to wait for your ink. SPEC ink dispensing systems will deliver the ink you need, when you need it, and it will be accurate the first time. We provide reliable and affordable ink dispensing systems for printers of every size and budget. SPEC ink dispensing systems are also the perfect solution to managing cluttered, costly ink rooms. Our software contains advanced rework features that allow users to track, sort, select, and re-use press returned ink. Visit our products page to learn more about our ink dispensing systems. SPEC offers a full line of liquid dispensing systems for ink, paint, dye, and adhesives. From our software only solutions to our fully automated systems, the focus of all our dispensers is to be the most accurate, reliable, and affordable systems available. SPEC, Inc. is an industrial process controls provider and a highly skilled engineering company capable of providing innovative solutions for a broad range of manufacturing problems. If you don’t see a solutions that completely fits your needs, contact our sales team for a free consultation. We provide all phases of a project from system design through installation, operator training and system support. I’ve dealt with other dispensers in recent years, but our SPEC system is much easier to operate and obtain crucial data. The software is very user friendly and customer service has always been available to answer any questions that arise. The system looks and works great. The install went flawlessly, the SPEC tech was amazing! What he was able to accomplish in the time-frame that he did it was incredible. I want to say thank you again! It goes without saying that SPEC manufactures accurate, reliable and easy to operate blending systems. As important as that is, it is not the main reason we exclusively choose to partner with SPEC. Your ability and willingness to assist our needs, and our customer’s needs, regardless of the request, is what sets you apart. President/COO, BCM Inks USA, Inc. It doesn’t take long for our customers to realize the long term benefits of owning a SPEC dispenser. Other dispenser companies have great marketing departments, but we let our system reliability and unparalleled customer service do the talking. HOW CAN A DISPENSER HELP YOUR COMPANY? Dispensing systems help printers gain a significant edge in today’s competitive marketplace by reducing the cost per batch and turnaround time. A reduction in overhead costs and quick ROI lead to increased savings. Dispensers help to improve plant efficiency by eliminating tasks associated with color reformulations and corrections. Labor is better utilized due to less downtime whichs turns into increased savings. SPEC dispensers ensure quality by using high precision scales and dispense valves to produce consistent batch to batch repeatability. SPEC iBlend software tracks job costs and raw materials for every batch dispensed. Eliminate expensive waste by making only what is needed for each job and working off excess inventory. SPEC iBlend software is also loaded with VOC reports to ensure environmental compliance. A SPEC dispensing system can become one of the most important pieces to your printing operation. 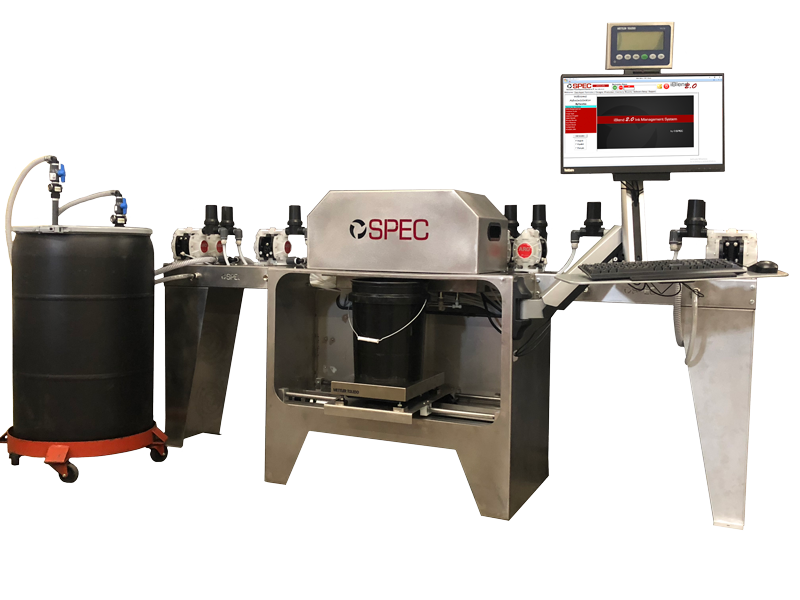 Many of SPEC’s customers are first time dispenser owners, but realize the value of our equipment and quality within the first few weeks of ownership. A step above other dispensers. Conversions & upgrades of competing systems. Still Curious How We Can Help?